(BLOOMINGTON) - Six Indiana University Bloomington staff members will be presented this year's Staff Merit Awards during a 3:30 p.m. ceremony Dec. 10 in the Frangipani Room at the Indiana Memorial Union. Given by IU Bloomington Provost and Executive Vice President Lauren Robel and Vice President for Human Resources John Whelan, the awards recognize six full-time staff members who demonstrate exemplary job performance and special efforts to improve Indiana University. Doug Bauder is the director of IU Bloomington's LGBTQ+ Culture Center, but the impact of his work extends beyond the center to students across the university and the Bloomington community, his nominators said. "Doug is always seeking ways to cultivate and create resources optimizing the IU experience and improving student lives," said John Nieto Phillips, assistant provost for diversity and inclusion. "His holistic approach has fostered a culture of civic engagement and a wave of social inclusion within the center and throughout campus." 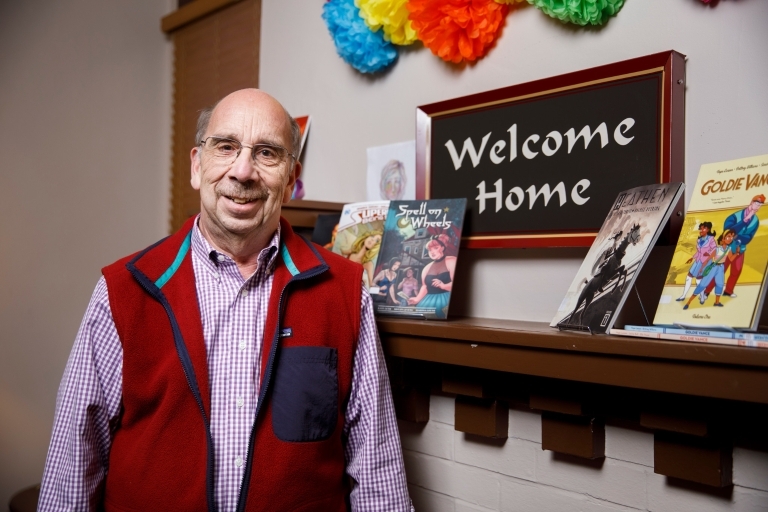 In his 24 years as an advocate for the LGBTQ+ community on this campus, Bauder has helped to provide a place of understanding, peace, and community. His work has helped IU Bloomington earn recognition as an LGBTQ-friendly campus. "Doug spends endless time giving students individual attention toward their academic, personal and social success," said Lillian Casillas, director of La Casa Latino Cultural Center. "It's that personal touch that helps our students feel cared for." Scholarly Writing Program director Laura Plummer's nominators praise her for the key role she and the program play in the professional development and success of IU Bloomington faculty. 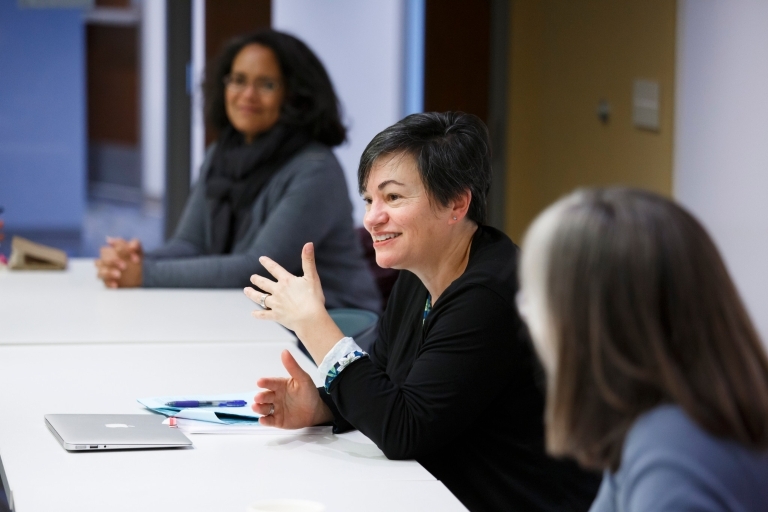 In her role, Plummer hosts weekly writing groups across campus, presents at workshops preparing faculty for tenure and promotion, and hosts a two-day overnight writing retreat for faculty. Her Scholarly Writing Program started in 2013 as a small program of 17 faculties and two writing groups, with Plummer as a volunteer leader. 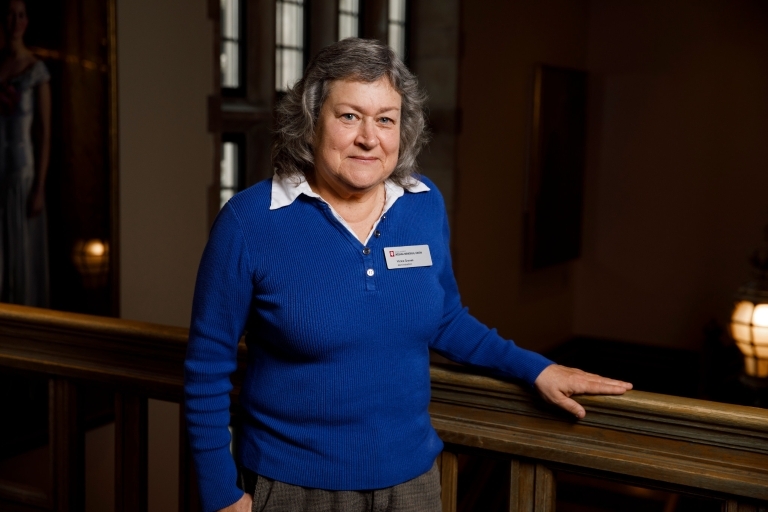 Plummer has since left her role as the Campus Writing Center director to develop the program, which now consists of 21 groups made up of more than 250 faculty members. Her mentors praise her for the careful planning she put into making the rapid expansion of the program manageable. "I am willing to bet that if you asked faculty across campus to name anyone who has had the greatest impact on their work life, the most common and enthusiastic response would be Laura Plummer," said Eliza Pavalko, vice provost for faculty affairs. "I have heard from faculty who said they turned down a lucrative offer from another university because of the sense of the community they have received from the Scholarly Writing Program." All of Plummer's nominators agree that the groundwork she has laid for the program will ensure that it continues to serve IU Bloomington faculty for many years to come. These are words used to describe custodian Tim Fleener by his nominators. But they agree that Fleener's initiative is what has earned him several honors and awards for outstanding performance and leadership over his 22-year career at IU. While he meticulously manages the maintenance of the six buildings for which he is responsible, Fleener is often the first to volunteer to help in case of a flooding, heavy snowfall or other emergencies in buildings across campus. "Tim shows great pride in each of the tasks that he does and is a model employee that leads by example, maintains or enhances our standards, and helps boost the morale of everyone," said Kip Shell, Building Services supervisor. Fleener's attention to detail ensures that the variety of day-to-day activities in the buildings he maintains proceed without interruptions or mishaps. "Attending to the details -- like the handprints on the glass doors, or raising the overhead door to make pickup for the trash and recycling truck easier, or showing up immediately after an event to clean up the area -- makes Tim a valued member of the team," said Steve Withem, facilities director for the IU Maurer School of Law. 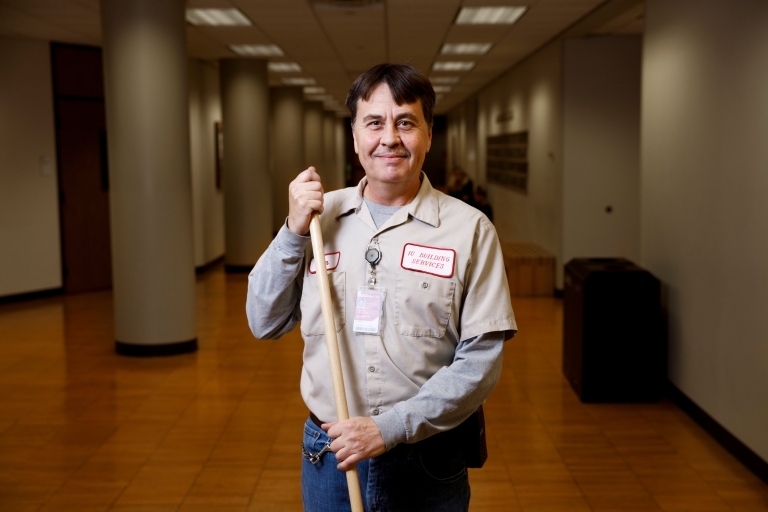 "Custodial work is a constant and relatively thankless job, but Tim has my sincerest gratitude." Custodian Rick Tungate may have more than 1,500 benefit hours banked, but his impeccable attendance isn't the only reason his nominators think he deserves to be honored with this year's Staff Merit Award. Tungate strives for excellence in his work maintaining the Simon Music Area and does so with a smile on his face. "Rick is well known for going above and beyond in his efforts to maintain the high standards that the area demands," said Frederick Burks, general supervisor for the Simon Music Area. 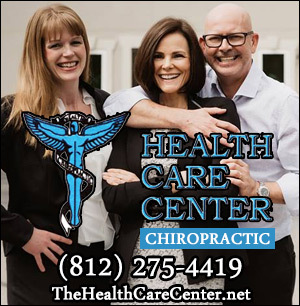 "Rick always shows up for work with a positive attitude, and no request is too much for him." In his more than 20 years at IU, Tungate has put serving others at the center of his work. Whether he's lending a helping hand to colleagues or ensuring that visitors have everything they need, he displays selflessness when on the job. "Rick assists staff members when in need or lends a hand to lighten the load," said Ronald English, area coordinator for Building Services. "He provides excellent service and represents Building Services in an exemplary manner." When Vickie Graves started working at IU nearly 40 years ago, all accounting was done with pencil and paper. When she was tasked with merging accounting with computer technology, her nominators said that she tackled the challenge with an eagerness to learn. In her dual accounting and IT roles for the IMU, Graves has continued to bring the same enthusiasm to each challenge she faces. "Even when deadlines are unrealistic, Vickie simply 'figures it out,'" said Doug Booher, IU Auditorium executive director. "'Figuring it out' for Vickie usually means finding solutions to seemingly insurmountable hurdles and staying keenly focused until the job is done, regardless of the hour or other distractions." Nominators agree that Graves never seeks praise or affirmation and that her enthusiasm, ingenuity, persistence, and dedication come from a genuine pride in her work. "Vickie is who she is, daily, for nearly four decades because she enjoys her work, loves her co-workers and is truly motivated by the intrinsic reward of knowing that she's making IU a better place," Booher said. During his 22-year career as an audio engineer at IU, Radio-Television Services audio director Mike Paskash has worked with reel-to-reel tapes, cassettes, digital audio tapes, compact discs, minidisks and more. He transitioned from editing radio programs using grease pencils, X-Acto blades and special adhesive tape to mastering complicated editing software. And his nominators agree he did so without ever missing a beat. 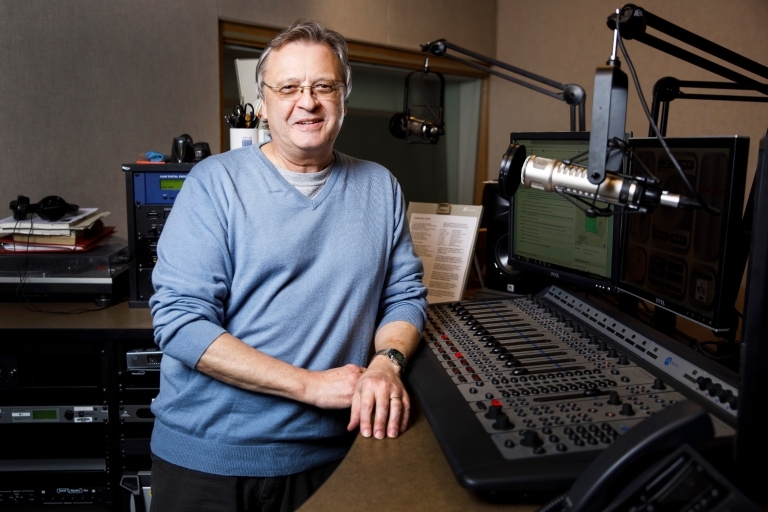 "Mike's job through the years has been a lot like changing flat tires when the car is going 60 miles per hour," said George Hopstetter, chief engineer for Radio-Television Services. "We know that we can count on Mike to get the job done." Paskash has produced thousands of programs broadcast locally and nationally, including "A Moment of Science," "Soul Kitchen," "Profiles" and more. He produced IU President Michael A. McRobbie's interview with actress Meryl Streep, coordinated studio interviews with national and international media when the late IU professor Elinor Ostrom won the Nobel Prize in Economics and produced several interviews with IU alumnus Will Shortz, editor of the New York Times crossword puzzle. "Mike Paskash has contributed so much over the course of his career at IU and has done so behind the scenes," said Will Murphy, program director for WFIU. "Thousands of WFIU listeners across Indiana and beyond benefit from his labors every day."